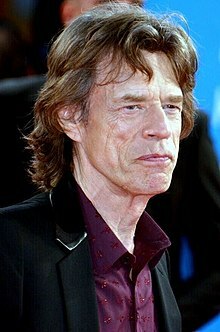 Sir Michael Philip Jagger (born 26 July 1943) is an English singer, songwriter, actor and film producer who gained worldwide fame as the lead singer and one of the founder members of the Rolling Stones. Jagger's career has spanned over five decades, and he has been described as "one of the most popular and influential frontmen in the history of rock & roll". 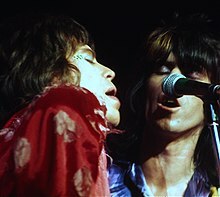 His distinctive voice and energetic live performances, along with Keith Richards' guitar style have been the trademark of the Rolling Stones throughout the band's career. 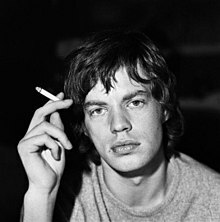 Jagger gained press notoriety for his admitted drug use and romantic involvements, and was often portrayed as a countercultural figure. ^ McNary, Dave (6 September 2018). "Mick Jagger Joins Heist Thriller 'Burnt Orange Heresy'". Variety. Retrieved 8 September 2018. This page was last edited on 23 April 2019, at 01:52 (UTC).